I visited Chablisien producer Michel Laroche’s first venture into Chile back in 2002, when his winery in the Maipo region was producing some very good wines under the stewardship of young English winemaker, Julian Grubb. On revisiting Chile and the same winery in 2007, the Laroche name had disappeared and the winery facilities were being used by another producer. Laroche had shut up shop and moved north to the Casablanca Valley.In fact it was in 2005 that Michel Laroche bought 53 hectares in Casablanca, adding a further 23 hectares of Sauvignon Blanc, Chardonnay and Pinot noir in 2006, as well as a functioning wine cellar. Thus, Laroche in Chile Take II was underway, with Cesar Chaud having recently taken over from Julian Grubb as oenologist and manager. Viña Punto Alto has two vineyards a few kilometres apart, planted mainly with Pinot Noir, Sauvignon Blanc and Chardonnay. There is also some Carmenère, sourced from Colchagua. 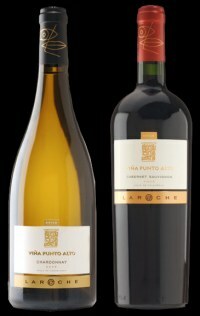 Like the Chablis wines of Laroche, Punto Alto is brought into the UK by Bibendum wines. From Casablanca. Rich, ripe aromatics. Very nice passionfruit and tropical fruit, not too green. Has a herbaceous but refined edge to the fruit on the palate. An attractive, commercial style of Sauvignon, with abundant fruit, plenty of weight and tang, with succulence and good acidity. 86/100. From Colchagua fruit, this has nice green fig and hazelnut aromas with a touch of green bean and vegetal aromatic over ripe orchard fruits. Succulent and clean on the palate, with a hint of tropical richness. Very good acidity, keeping it fresh and crisp with a lemony tang. 87/100. Another Casablanca wine with a sophisticated nose, with elegant, mealy richness and touches of almond and fig, as well as pure apple aromas. The palate has some orange fruit and fresh, lemony zest, with a succulence and touches of chewy, rich biscuit. Plenty of vivacious acidity in a nicely-styled wine. 88/100. Elegant nose, with a touch of leafy quality, and refined raspberry fruit. The palate has good fruit quality, with a creamy texture and plenty of acidity coming through. There is good grip, and though it lacks a little flesh on the finish, it is taut and savoury. 87/100. Made from Colchagua fruit, this has pure cassis ripeness, with hints of mint chocolate and humbugs. The palate has really good weight and freshness, with savoury qualities coming through, showing some earthiness and tobacco and spice. Lovely quality and length here, with refined tannins and lovely acidity. 89/100. A touch of minty eucalypt character, with minty ripeness, but perhaps lacks a little Pinot character on the nose. The palate has a more convincing Pinosity, with soft strawberry and raspberry fruit, and touches of chocolate and coffee. Very nice drinking, in a clean – perhaps slightly too clean – style. 87/100.